Do you dream of taking a National Geographic-worthy photograph of the Northern Lights? We talked with Lance at the Travel Addicts about how to do it! 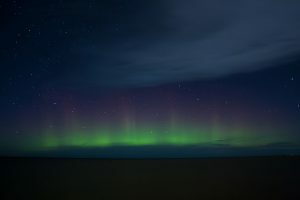 For the purposes of this article, we assume that you are in a place where you can see the Northern (or Southern) lights and that it is night time when you are trying to take the photograph. If these are your circumstances, then there is a reasonable chance you will get a picture of the Northern Lights! First and foremost: Lance says that any decent camera will be enough for a great picture of the Northern Lights. It doesn’t matter if you use a point-and-shoot camera or the one on your smartphone: In this day and age anyone can take a decent Northern Lights photo. He also says that there are only two pieces of equipment that are absolutely necessary: A camera and a tripod. Set the shutter release (when you press the button) to the same delay that you use when you take a selfie — at least 2 seconds. It is possible to take a good Northern Lights photo with your Android or iPhone, using nothing more than the camera setting on your smartphone. But it’s not what he recommends. So, what DOES he recommend? Download an app! There are a few that Lance recommends, including LongExpo Pro and the Northern Lights Photo Taker App. When you open one of these apps, it will take over the settings of your Smartphone camera. Don’t worry — that’s what it’s supposed to do! Because the camera on your smartphone is more sensitive than the ones on a point-and-shoot, Lance advises that you start with 15 seconds of exposure, then adjust up from there. And remember: Use the tripod! You can follow Lance and Laura on their travels via Facebook, Twitter, Instagram, and Pinterest, or on their website. Readers can find more information on the Northern Lights on Travel Addicts. This entry was posted in Blog, Photography Tips and tagged digital photography, Photographing the Northern Lights, photography tips by ScanMyPhotos.com. Bookmark the permalink.